"Death is among you. Moving around the world like a shadow, Overwatch Rider is a mysterious mercenary whose motives remain unknown. Designed for the ultimate Overwatch fan, this Collector's Pack contains 2 Reaper Blasters designed in the style of Reaper's famous props, in Blizzard Entertainment's world-renowned team action game. It also contains a replica of the Raucheur mask, with an adjustable strap, that Overwatch fans can wear and display. Each of these two breech-loading Nerf Rival Overwatch blasters can hold 8 foam balls, which they shoot at a speed of 27 meters per second. They also have spring mechanisms, status indicators, and trigger locks to prevent them from accidentally pulling. 16 Overwatch Nerf Rival foam balls included. Hasbro and all related terms are trademarks of Hasbro. Copyright 2018 Blizzard Entertainment, Inc.
• Includes: 2 blasters, 16 foam balls, mask and instructions. 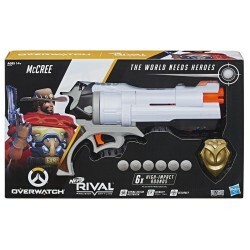 • Includes 2 accessory-style blasters used by Overwatch's Hero (Wight Edition) hero in Blizzard Entertainment's world-renowned team action game. 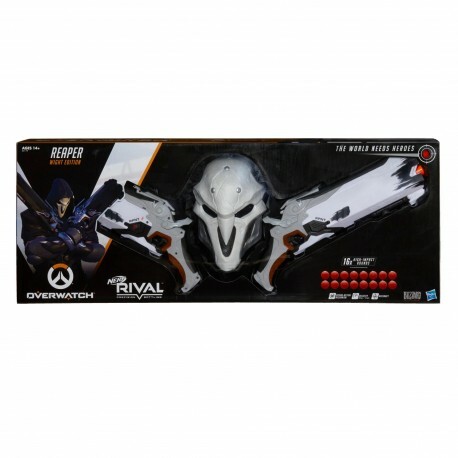 • Sold with a replica of the Reaper Mask, with an adjustable strap, that Overwatch fans can wear and display. 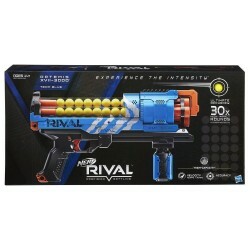 • Each blaster can hold 8 foam balls, which it fires at a speed of 27 meters per second.